At first sight the works refer to significant symbols of a Christian tradition. They have been displayed on the occasion of Easter, the most important Christian festival. All the scenes precede a central motif of the feast, which is the resurrection of Jesus Christ. 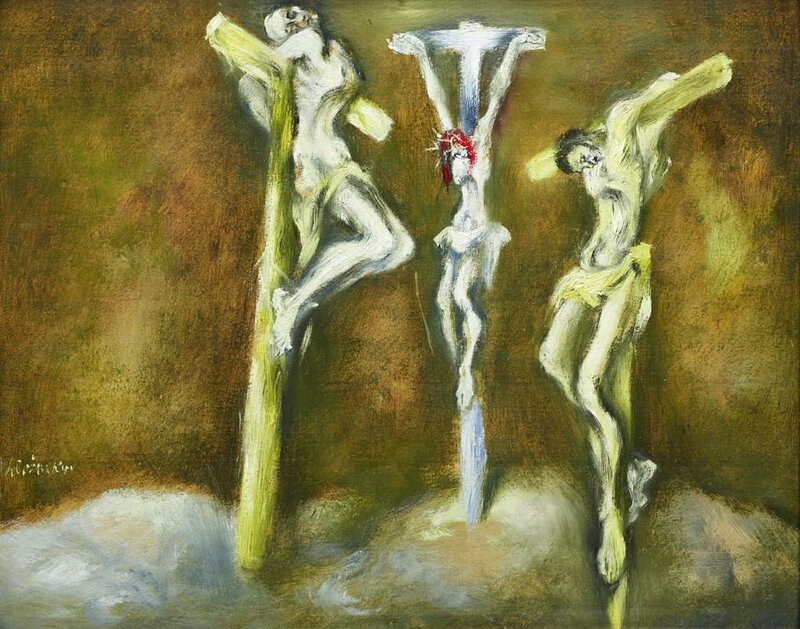 A suggestive depiction of Christ´s crucifixion at Golgotha was executed by Vincent Hložník, just as the painting Pieta, which shows one of the most typical and mournful iconographies of Christ. 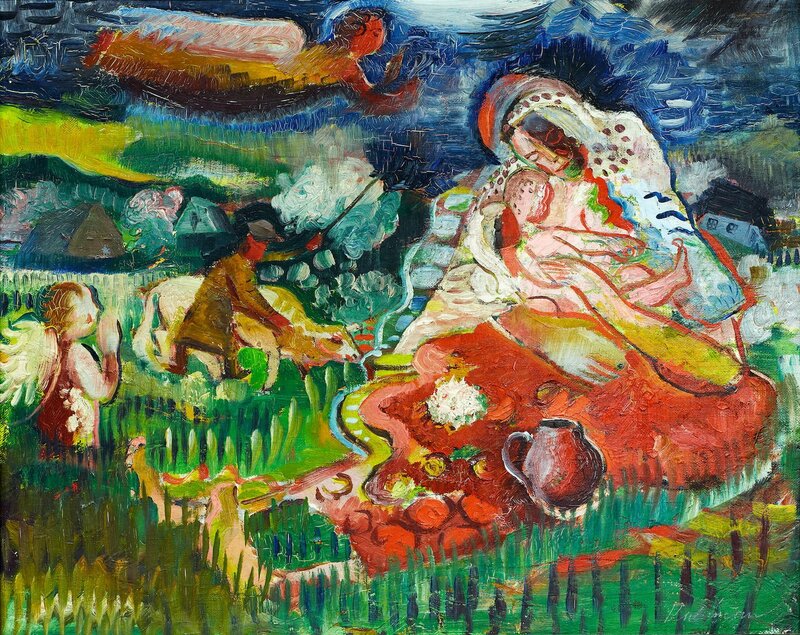 Peter Arnold Weisz-Kubínčan painted Jesus in his mother´s arms as a carefree child surrounded by greenery into which the artist also set other oil paintings and pastels showing Madonna. The scene is not separated from ordinary earthly life. In the background one can see a shepherd herding an animal and the roofs of houses. It is basically a universal image of mother and child, perhaps only the angels and the suggestion of a halo indicate Madonna. Portrait of Christ was made by Rudolf Krivoš. The suggested picture remotely resembles the image on the Shroud of Turin. 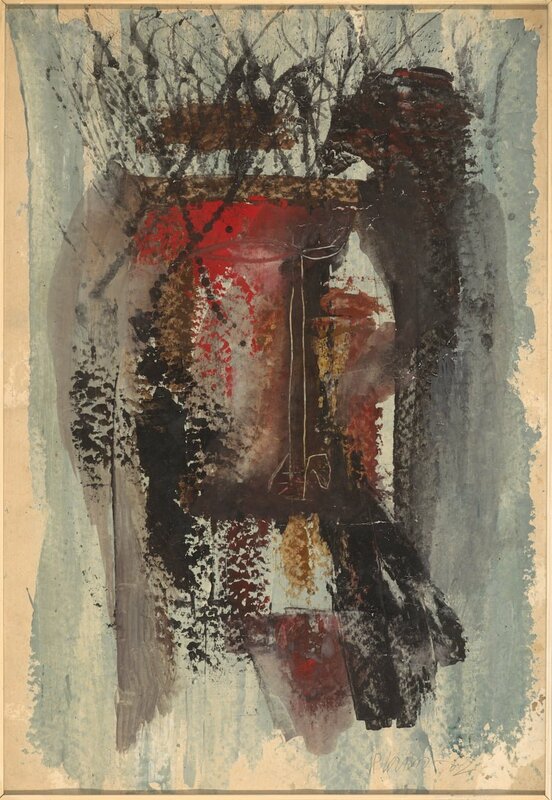 The association is enhanced by red colour on some parts of the face consisting of overlapping traces of gouache. In connection with the aforementioned scenes, the church in Miloš Alexander Bazovský´s painting represents a room for silent memento. The boat, too can be understood as one of the oldest Christian symbols, as the reference to Noah´s Arch can also include salvation sought by many through faith.